Researching my latest food and travel book, Andaluz – a Food Journey through Southern Spain, took me across the entire region of Andalucia, tasting, talking and researching as I went. Here’s a taste of the first chapter: Almeria, out on a limb to the east so often overlooked. I knew this corner of Spain decades ago, but there has been a hiatus. When I returned in November 2016 I found a buoyant city, fast-moving on the gastro front, within easy reach of the stunning natural park of Cabo de Gata, its volcanic forms visible on the horizon below. The previously run-down city appears to be blooming, yet barely touched by tourism – for the moment. In late 2018, Almeria was declared Spain’s Gastronomic Capital for 2019 – so watch this space. 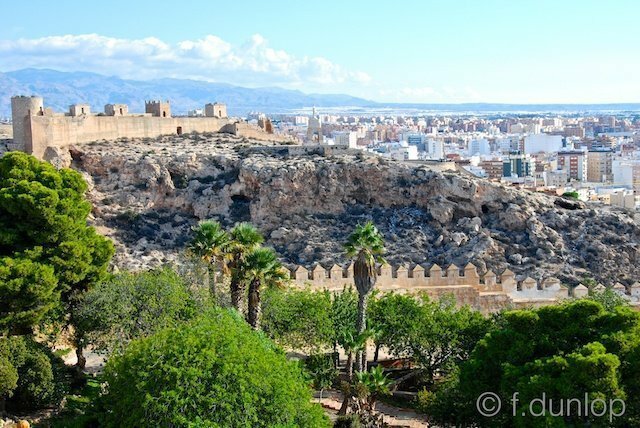 You can’t miss Almeria’s crowning glory, a spectacular 10th century Moorish alcazaba and the largest Muslim monument in Europe after the Alhambra. Years ago I explored it when the entire surrounding area was considered very dodgy, but this time I find myself peacefully alone among the ancient stones, jasmine, fountains and palm-trees. Restoration has done wonders, and archaeologists are still at work on one section. It’s the morning after Halloween which the Spaniards – and particularly the Almerienses – have taken to with gusto, so the city slumbers. The views from the ramparts are stunning, looking north over more turreted walls which continue down a canyon and up a hill opposite, over La Chanca, a still down-at-heel area to the west, the sparkling bay, the port with its ferries that whisk workers back to north Africa, and the mosaic of flat roofs below that is the Barrio de la Medina, the original Moorish quarter. At the back there’s even an area of reserve for rehabilitating gazelles from the Sahara. Behind loom the dark schist forms of the Sierra de Alhamilla, a mountain range that runs west through lunar-like terrain to join the Sierra Nevada. Down in Almeria’s town centre, I of course make a beeline for the newly renovated Mercado Central just off the broad and rather elegant Paseo de Almeria. The slick-looking market is packed with local produce but it’s downstairs where I find the most salivating section – seafood! Mountains of scarlet shrimp, prawns, langoustines, great hunks of tuna, red mullet in abundance, silvery anchovies, anglerfish, mackerel, dogfish, octopus and squid – all glisten and beckon, freshly fished from the Mediterranean including via Garrucha, a busy port up the coast, and Roquetas, to the west. Some fish are artfully displayed like contemporary sculpture giving the experience an extra visual plus. 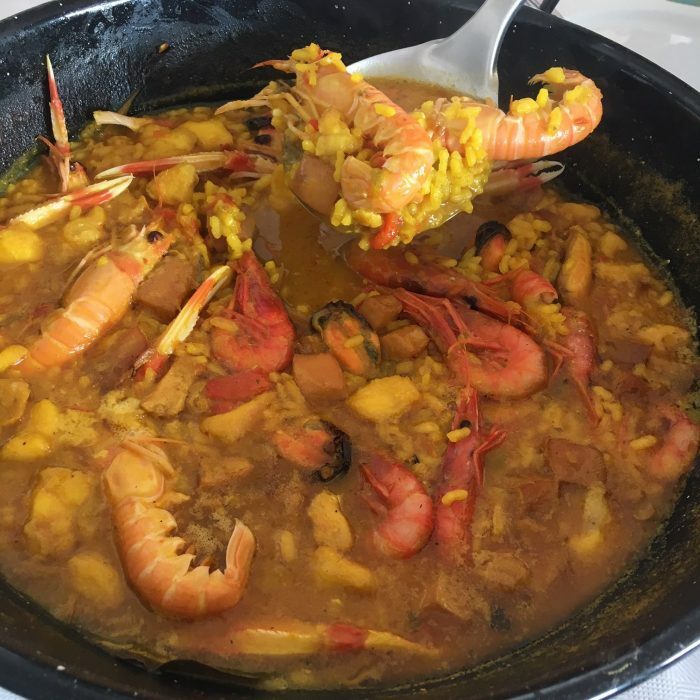 Seafood soup or arroz caldoso de marisco (soupy paella) is a typical local dish that combines a good half dozen varieties, hardly surprising given the range and quality of Almeria’s piscean splendours. And of course there’s ample pescaito frito (fried fish), that Andalucian classic. Of course many of the fruit and vegetables come from the hideous invernaderos (polytunnels) that feed all Europe, all year round and blanket the coast for miles. They’re a blight on the landscape, and the Moroccan and Sub-Saharan workers at El Ejido, the polytunnel ‘capital’, get dismal treatment, conditions and pay. But the result is that we can eat asparagus, peppers and tomatoes in winter, and the passive solar heating (they all face south) at least ticks one box. The discarded plastic doesn’t, nor the huge drain on water resources. Other than glossy vegetables, there are robust local wines (Laujar de Andarax in the Alpujarras is a big producer) and even olive oil from the desert region of Tabernas – something I find surreal given that the little town has been the stage-set location for dozens of spaghetti Westerns and is about as arid as you get. So let’s cut to the chase. 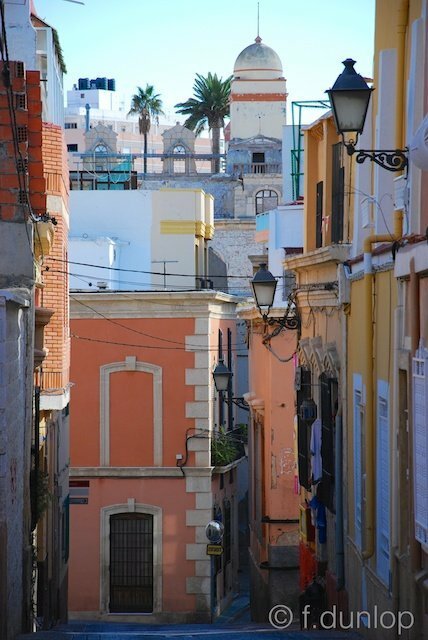 To taste all this I head across the Paseo into a grid of narrow streets lined with tapas bars, little restaurants and mansions from Almeria’s 19th century heyday. As I am staying at a hotel bang in the middle of it all, a late-night tapa or two is easy..
1. Valentin – For an upscale seafood dinner or tapas I’d recommend this elegant restaurant and tapas bar open to the street (below). Service and quality of tapas are first rate, though it’s more costly than other taverns. Their seafood rice (paella) is a triumph, as is the shellfish selection, and service invariably cheerful, as in most places in laid-back Almeria. 2. Across the street you can’t go wrong at the 30-year old classic, Marisqueria Baviera which has spawned two branches down nearby side-alleys – both heaving on weekend evenings. Shellfish is one speciality here as well as excellent fried fish, and even wagyu beef. Sit at the bar for the action and order a copa with any of the succulent tapas. Sea-snails (below) are excellent. Reasonably priced too. 3. 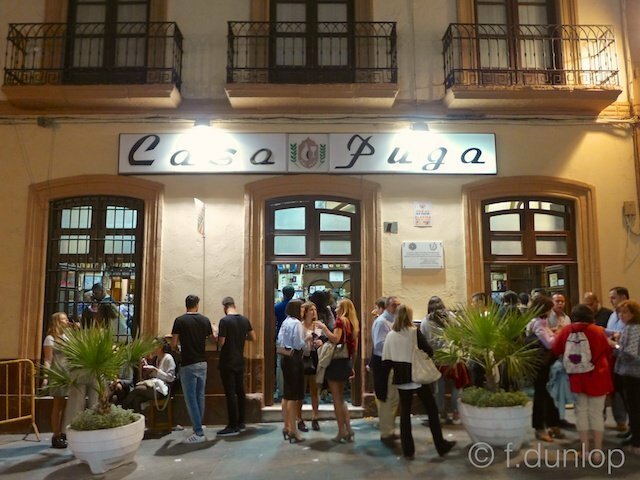 Casa Puga, Almeria’s oldest tavern (it dates back to 1870) is a city landmark and still does a great job at keeping the inhabitants well-imbibed and well fed. Go early (midday or 8.15pm) as it fills up fast. The quality of their traditional tapas is surprisingly good, but it’s the atmosphere that counts here. The family-owned bar is particularly proud of their wine from the nearby Alpujarras, Albuñol. 4. Just up the street from Puga, Nuestra Tierra Taberna is a relative newcomer to the scene yet striding ahead thanks to a wide range of healthy, unusual tapas like the roasted local vegetables below. 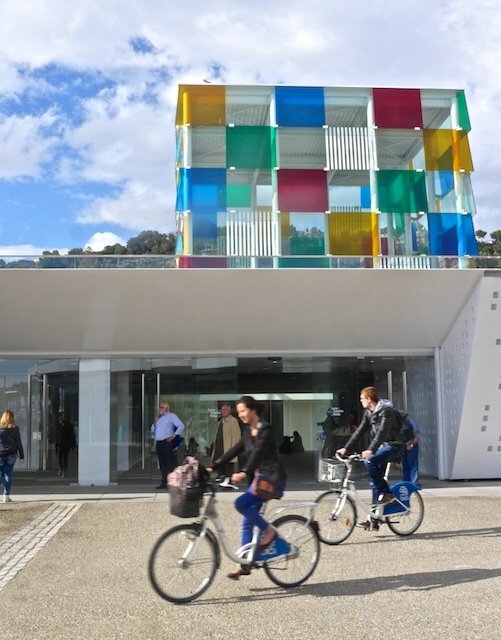 Their clientele is young and hip, and the wines on offer are mainly from the Almeria province. They have more tables than bar space, so it feels less like a classic tapas-bar, more like an informal restaurant. Some tapas come free, others you pay for. 5. Chic and very Basque in style (as is the owner), the Joseba Añorga Taberna is hidden away in the lovely arcaded Plaza de la Constitucion, just a few steps from the buzzing Calle Jovellanos. Very stylish, it serves beautifully presented pintxos in restaurant style by owner-chef Joseba Añorga. Lots of foie gras as below, with apple purée, so hold on to your livers. A fantastic wine-list too. 6. Finally, very different from all the above, so hors catégorie as the French would say, is the Bar Bahia de Palma, calle Mariana 17 – between the main cluster and the Cathedral. It is a real local favourite, packed with bullfighting memorabilia, unpretentious, and offering a limited choice of homecooked tapas. But they’re good! Like the migas below, prepared in Almeria style of course.